After customizing a Quick Access Toolbar, you can quickly copy it to other computers. You can add your favourite commands or even missing commands to the QAT for quick access. All of the Office applications support a QAT. If you have or support more than one system, you don’t have to duplicate your efforts where QATs are concerned. Instead, customize one and copy it to other computers. Just be careful because Office 2007 QAT files aren’t compatible with Office 2010 QAT files. Each application has its own QAT file, as listed in the following table. When copying Outlook files, be sure to select the right one (or all of them) as your copy of Outlook might have several .qat files. Office saves the .qat files in different locations, depending on your operating system. 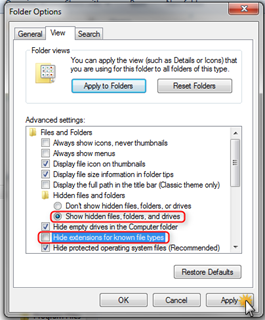 NOTE: to find these file locations make sure in the Folder Option, under View, you have selected to show hidden files, folders, and drives and unselected Hide extensions for Known file types. 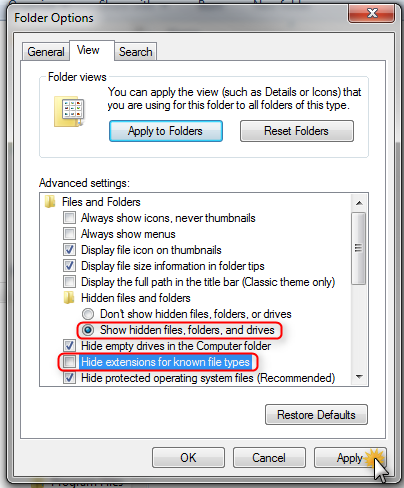 Run a Windows Search to find the files if your system is configured differently. After locating the .qat file, copy it to another computer. Be sure to note the actual location in your source computer and copy the file to the same location on the target computer. Of course, it’s different for Office 2010. In this version, the .qat files are now .officeUI files. 1. Save the .qat files to disc or someplace safe so they’re not destroyed during the installation of Office 2010. 2. After installing Office 2010, give the new .officeUI files a new extension name, such as .officeUIorg, so you can recognize them later. You want to keep them around, just in case. 3. Then, copy the 2007 .qat files in to the above folder location and rename it to use the .officeUI extension to the appropriate folder in Office 2010. I repeat, do not write over the .officeUI files. Rename them, so you can retain those files in installation order.